Can I pause my account for time being? Yes, in order to keep your profile and all data for later use, you can have your account paused. Alternatively, contact support specifying your Woodpecker login. 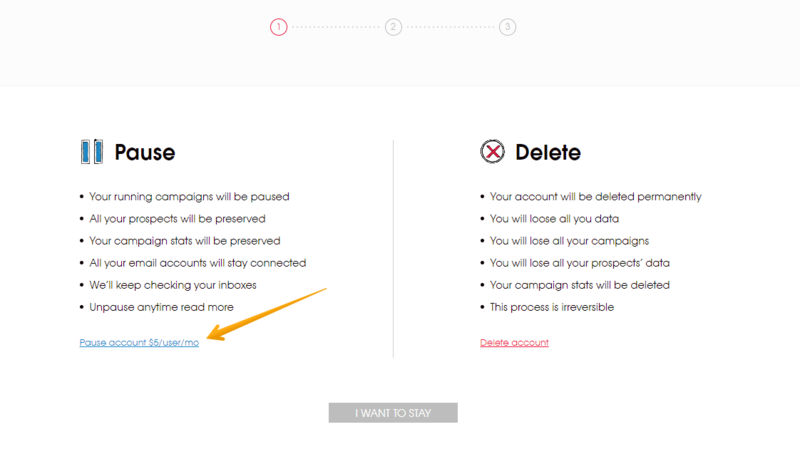 Details: While your account is paused, sending emails and creating new campaigns is disabled, but you retain full access to all your data: you can review and tag messages in Inbox, update your prospect base and download any entries to a CSV file, as well as review any of your campaigns, and related statistics. These will also update with any new replies from your prospects during the pause. Pricing: When your account is paused, the monthly fee is reduced to $5 per Seat (regardless of your pricing plan). The most recent fee is also discounted from your next standard payment when you come back to full subscription. For example, an account with 2 Seats was paused for 6 months, with a fee of $10 per month, and "generated" a discount of $10 (2 × $5). The payment will then be $70 (instead of $80) when resuming.